Even with the popularity of The Avengers and other heroes, interest and enthusiasm for mutants is still at a very high level too. And yes, they still have their very own comic book series. Case in point today is the brand new, upcoming X-Factor, from writer Peter David and artist Carmine Di Giandomenico. Serval Industries, the world’s foremost leader in cutting-edge internet and weapons technology has just unveiled their newest contribution to society – it’s superhuman division, the All-New X-Factor! 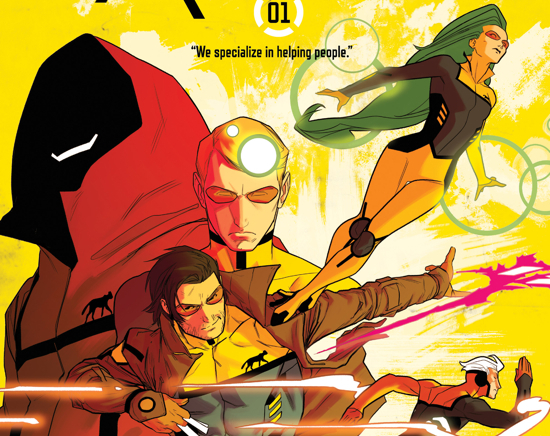 Led by Polaris, the mutant mistress of magnetism, fellow X-Factor members Quicksilver, Gambit, Danger, Cypher, and Warlock use their powers for the betterment of society. Or are their corporate backers at Serval Industries using X-Factor for the betterment of themselves?